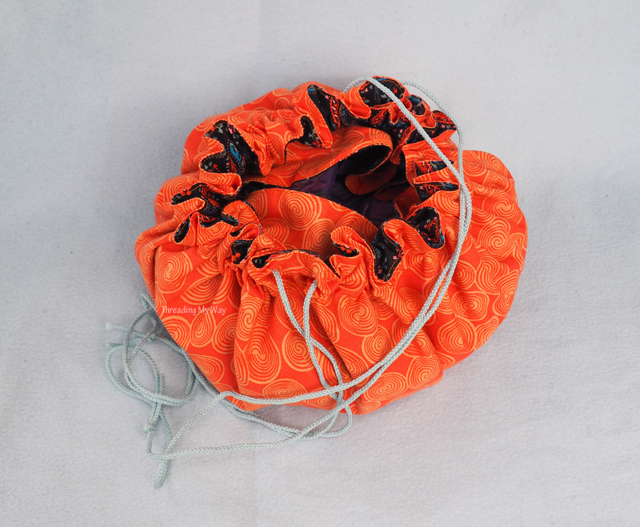 The Bundled Up Bindle Bag is a circular drawstring bag with a difference. Hidden inside are LOTS of pockets. 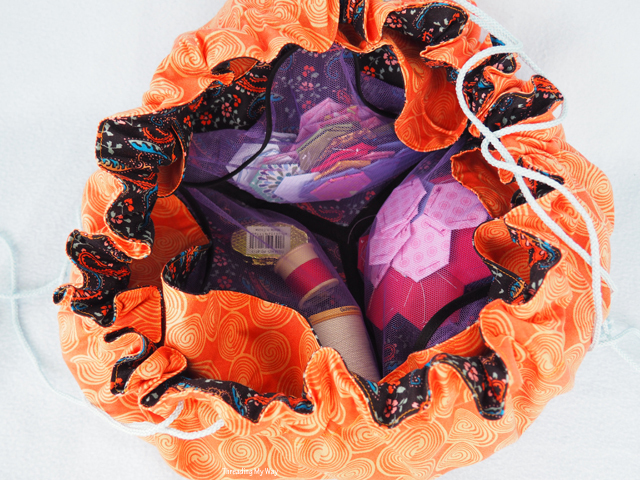 Made with eSheep Design's latest PDF pattern, the bag is easy to customise and can be used to carry and store a myriad of items. After testing the Retro Reticule bag pattern for Rochelle, I was more than happy to test the Bundled Up Bindle bag pattern when she asked. I knew the instructions would be detailed and the pattern easy to sew up. I was not disappointed. The pattern suggests using two layers of wax cloth or laminate for some of the pockets, but I chose to use quilting cotton throughout. Tips for sewing laminates are included in the pattern, as well as suggestions for possible cheap sources or alternatives to laminate. I fully intended to insert grommets, as suggested in the pattern, but when I sifted through my old packets of grommets, essential pieces were missing. Once I begin sewing, I don't like to stop just because I don't have something I need. I sewed some buttonholes instead, enabling me to finish in the time frame I had planned. As well as the internal laminate (or in my case quilting cotton) pockets, there are mesh pockets. Despite the fact that the pattern suggests cheap, alternative sources of mesh, I went ahead and bought some online. Ha - mustard mesh just didn't work with my fabrics. A quick rethink, and I found some purple tulle in my stash. At least, I think it's tulle. Maybe not, though, as it's very soft and not at all scratchy. As the bag opens up, you can start to see all the pockets. For the photo shoot, I grabbed the contents of my travel sewing kit. Plenty of spaces to fit everything with room to spare. 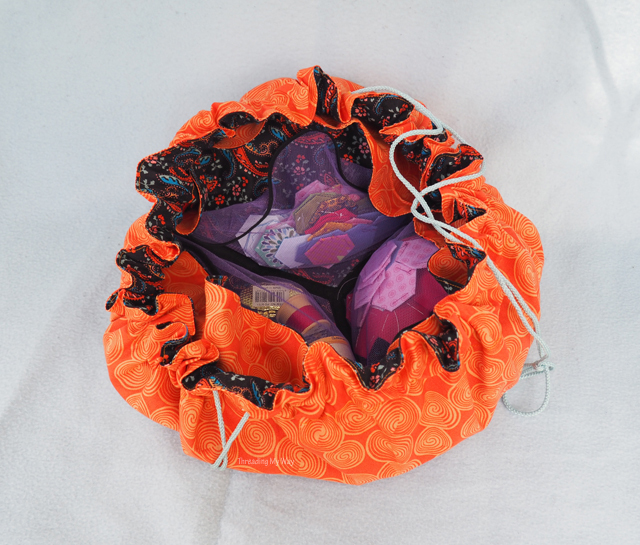 eSheep Designs Craftsy store where you can grab the pattern for whatever you want to pay. Rochelle has written a very interesting post on PDF pattern pricing. I'm very happy with my new bag, both the design, the size and the fabrics. Back in the 70s I was in orange overload - kitchen accessories, furnishings, even clothes. After a break of many years, I'm ready to again bring orange back into my life, perhaps not as enthusiastically as originally, though. I haven't decided what I'll use my new bag for - possibly another bag for carting around hand sewing projects. What would you use it for? That's a seriously cool bag!! It would be perfect for make up too. What a beauty! 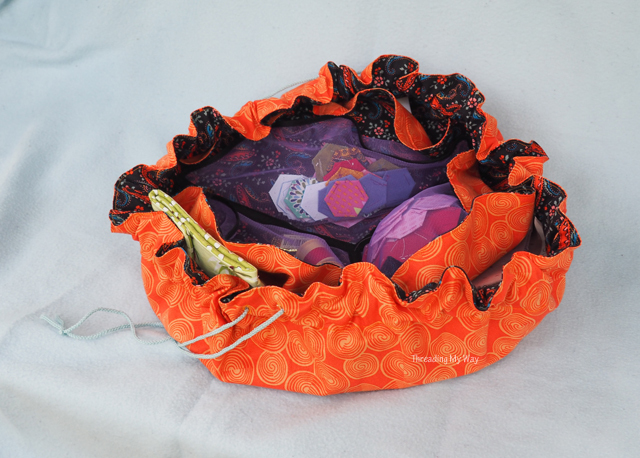 Perfect for storing all the tiny little bits you need when out with a baby in a stroller! 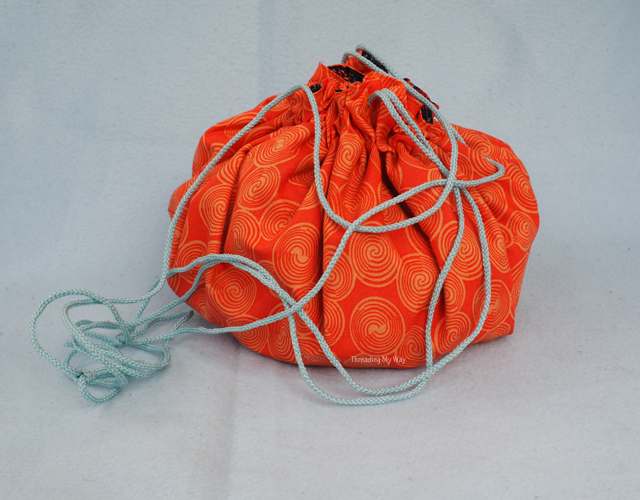 It would also make a perfect travel busy bag for a toddler! 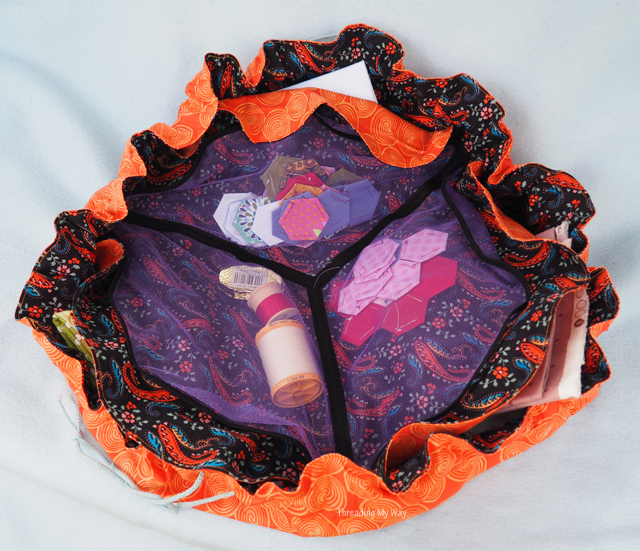 Get the pattern out there for all young moms to see! So useful! This would be a great bag for my middle schoolers! Small but can hold their lipsticks, phone, etc. You are a rebel Pam ;) The bag looks fab! i can definitely relate to not wanting to stop once I am on a project. I have a similar bag which I use for my jewellery when I travel. I had to replace an old one made for me by my sister-in-law, so I made a few adjustments. I wrote a "How to .." blog post. 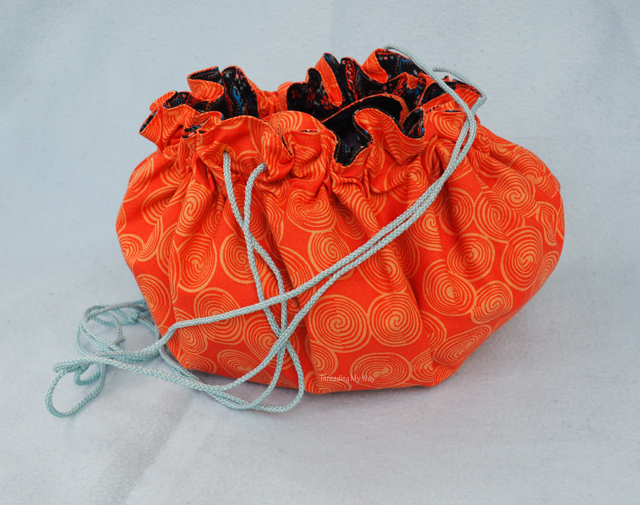 If you search my blog for jewellery pouch, it should pop up. That does look a perfect bag for travelling crafts. How long did it take you to make it do you reckon?